What appears to be a majestic mermaid tail is actually a soft knitted blanket that wraps the legs in a cozy layer of warmth. 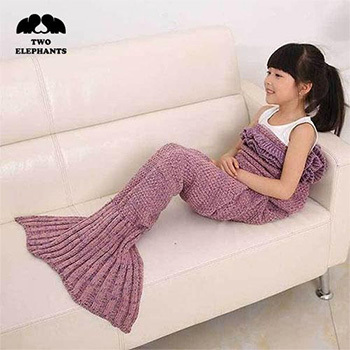 This soft, knitted Mermaid Tail Blanket is much more fun than an ordinary blanket. Use it on camping trips, long car rides, snuggling up with a good book or watching TV. It makes a great gift for the mermaid lover in your life. Care: Hand wash or machine wash gentle cycle inside lingerie bag; dry flat.